Tetris has been around for quite some time. We're talking 34 years of Tetris games across all sorts of platforms. There are too many Tetris games to count, and more being released every year. The Tetris fun never stops, as the brains behind the game are always cooking up new and unique ways to play. You never know what twist on Tetris is right around the corner! With so many new Tetris experiences coming out, there's an alternate side of things that we don't often think about. When you open up your copy of the latest Tetris game, it might mean the previous version gets pushed aside. If you're really digging your new Tetris title, the old copies of Tetris may end up shelved indefinitely. Tetris games of years gone by which provided so much fun, only to get displayed on shelves as decoration. Thinking about shelving games always makes me feel a bit down. I own a ton of Tetris games, both physical copies and digital. I won’t deny that I was guilty of pushing aside previous Tetris games for the new ones. You always have to go for the latest and greatest, right? No matter what Tetris game has your attention, it's important to remember how we got to those new versions of Tetris! We wouldn't have games like Puyo Puyo Tetris without experiences like Tetris on the NES. When I stopped to think about that, I decided it was high time to give my classic Tetris games a way to live on. I write about video games. This includes a wide variety of games across various consoles and portable devices. As such, I've amassed quite a collection over the years. The entire back wall of my office is a giant shelf showing off games from the last 10 years or so. I have a different room where I actually play these games. In that room is yet another set of shelves showing off games from years earlier. This includes versions of Tetris I hadn't touched in years. My game room on the main floor of my house is all about new games (the stuff I play to review). As for my shelves of classic games—including multiple older versions of Tetris—I felt they deserved to be put back into action. This is why I decided to turn my basement into a bit of a retro gaming den. It started when I grabbed the systems from years gone by, as well as all their games, and made a dedicated space for them. As you’d imagine, it took quite a bit of doing to collect all my older platforms and hook them up to a new gaming spot in the basement. Especially considering the games and consoles of previous generations have a lot more wires attached! They also don't have the best tech when it comes to picture quality and audio. Still, I went through the trouble to get the appropriate tech to marry all these devices together. After a couple weeks of work, all of my retro systems came together in a spot where they can live on and actually serve their purpose! While all sorts of old-school games are being played, there seems to be one franchise my friends and I keep turning to. 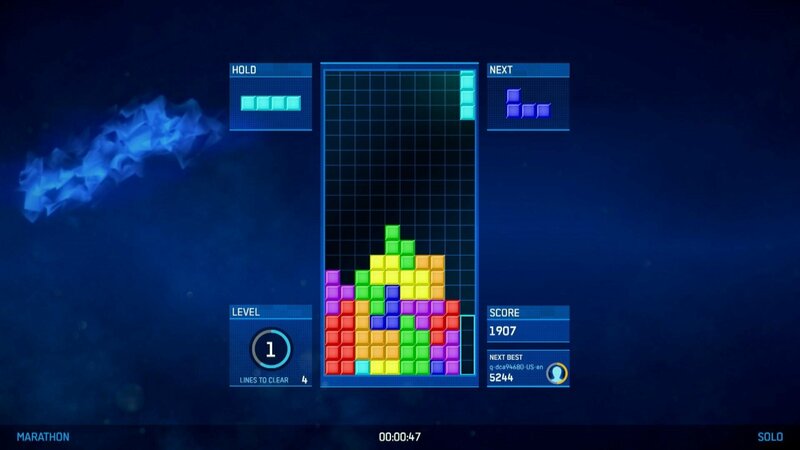 We simply can't help ourselves when it comes to Tetris. Everyone is always ready to throw down with a bit of Tetris, and our main game to fire up is Tetris on the Nintendo Entertainment System. Now, we're making new memories with this classic game! The retro visuals, the unforgettable tunes, and the tried-and-true gameplay. Tetris on the NES is providing us with just as much fun now as it did back in the day. You name a gaming platform, and we have Tetris ready to go. The basement houses the Nintendo 64 with Tetrisphere locked and loaded, and even Tetris Worlds for the GameCube. There are multiple versions of Tetris downloaded on the PS3, including options for the PS1 and PS2. We even have the classic Game Boy version of Tetris stored on a shelf right by the TV, complete with one of those giant Game Boy-themed carrying cases. My basement has not only turned into a retro gaming paradise, but a one-of-a-kind Tetris haven. In all honesty, we spend more time in the basement playing classic Tetris than we do upstairs with the latest games (minus Puyo Puyo Tetris, of course). We have that on the Nintendo Switch, which we can always grab and bring down into the basement. When we want to play, we set it up on the table next to the TV and get some tabletop-screen action going on. With my basement redesigned around classic gaming, I’ve become more eager to head out to retro game shops and grab versions of Tetris I've never owned before. Tetris is fueling my passion for retro games in general, and something I thought would be a fun diversion has now become an expensive hobby! Still, when I fire up my first round of Tetris on one of those classic gaming systems, it's all worth it. Nothing beats a game of Tetris, no matter how or where you're playing. Want to fuel your own love of Tetris? Click here to play Tetris for free right here at Tetris.com!